Hay fever sufferers who are allergic to pollen might be surprised to know that their home can be a haven for other potential allergens such as dust and pet hair. If you suffer from a pollen allergy you will be more likely to also suffer from perennial rhinitis, which is a year-round case of hay fever. This means that your symptoms will continue throughout the year although you may find that you experience periods of intermission as well. Perennial rhinitis tends to be triggered by indoor allergens. As such, it's important to make your home as allergy safe as possible. This will require some consistent lifestyle adjustments to ensure that your home is allergy safe. Dust is a common allergen for people who suffer from year-round symptoms triggered within the home. The solution is simple in theory - keep your home dust free and clean - but in practice it can be overwhelming trying to maintain a dust free home. This is particularly true if you have a large house. Areas that often trap dust but tend to be neglected during cleaning include underneath the bed, window ledges, baseboards, light fixtures and ceiling fans. 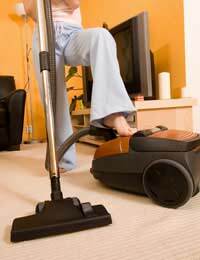 At the very least, regular vacuuming of floors and under beds can help to reduce the amount of dust in your home. If you can aim for a monthly 'deep' clean of those often neglected areas such as light fixtures, your allergy symptoms can significantly benefit. If hiring a cleaner is within your means, then it's recommended that you do so because this allows for regular, consistent cleaning and dust reduction. It's also important to note that when dusting, be careful which cleaning products you use. Many people with perennial rhinitis are also sensitive to chemicals in cleaners. It's therefore wise to consider a natural-based cleaner with essential oils. If you are dusting regularly and frequently using a cleaner to reduce dust, it's even more important that you use a non-allergenic cleaner. Mould is another common allergen for those who struggle with indoor allergens. Moulds can easily be found wherever there is a sufficient supply of moisture and oxygen. Mould spores are microscopic but when inhaled, can cause distressing and painful hay fever symptoms. Also, the mould spores themselves are so tiny that they easily invade a person's respiratory passages, leading to irritation in the throat, nose and eyes. Ultimately, the best way to prevent mould growth is to keep your home dry and clean. This means ensuring that your windows are adequately glazed, particularly if you're in a rainy geographic area such as Britain. Regular wiping and disinfecting of window ledges and airing out couch cushions in the warmer months can help to prevent moisture and the subsequent growth of mould. Pay particular attention to your bedroom; given the amount of time spent sleeping, dust in this room can leave you sniffling and congested throughout the day. If you find that you wake up experiencing severe allergies, you should look to your bedroom for the source. Your home doesn't need to be a source of pain and discomfort when it comes to your allergies. Although keeping your home allergy safe does require certain lifestyle changes, these changes are manageable and can make a big difference in reducing your allergy symptoms. Better still, you can also enjoy a clean home!